The Incredible Bookman | OhGizmo! 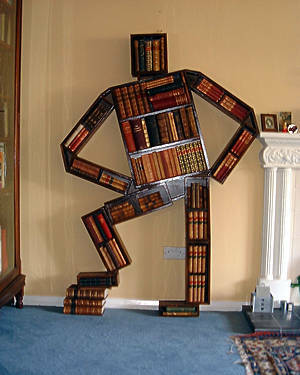 Designed by East Anglian artist Kazmierz Szmauz, The Incredible Bookman holds about 100 books. It is 70 inches high by 45 inches wide and is made from Mahogany, although other woods can be used. Each Bookman is signed by the artist, and costs $1,700.